First off - a mad happy dance that is slightly more scary than the book to your left. 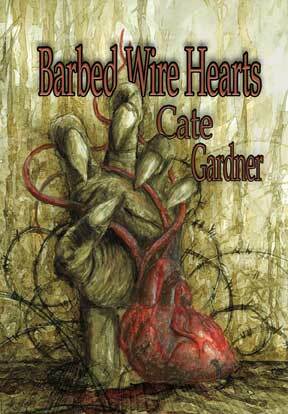 Barbed Wire Hearts is now officially on sale - hardcover and eBook - and can be purchased at DarkFuse. Eddie Stock's heart dislodges from his chest, drops to his bowels and dribbles down his thighs when the girl he likes laughs at him. Well the girl he likes and his entire school year. Finding himself in a forest, which has mysteriously sprouted about his town, Eddie meets a man named Ghoate. Ghoate collects hearts. They hang from his ceiling and they rot within his jars. Ghoate also collects minions and it appears Eddie is his latest recruit. Elsewhere in the forest, a dead girl is waking. Rose Lovering's heart wasn't strong enough to allow her to live and isn't weak enough to end this living death. Can Rose help Eddie regain his heart and save their town? And, can Eddie save her? 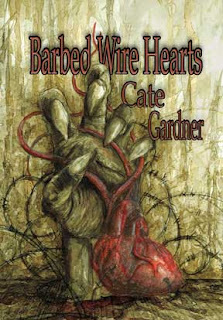 And what do you have to do to win - buy Barbed Wire Hearts (hardback or ebook) and send me an email at catephoenix@gmail.com saying you'd like to win one of the above prizes. If you've already bought it - thank you - let me know so I can enter you in the competition. Unless of course you'd rather not have a chance to win an arc of Theatre (are you mad!) (note to self: do not abuse possible readers/entrants). Oh and Aaron Polson and Katey Taylor, you guys are already entered as a thank you for being Barbed Wire Hearts first readers - you rock. Cool competition count me in. Yay! I have my copy.